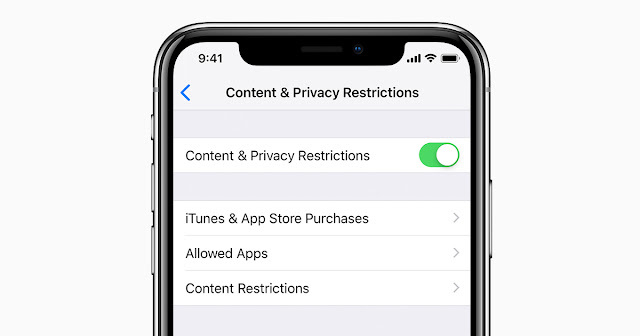 Everyone is looking for privacy and protection for his children, that's why Apple made a known feature called restrictions also known as 'Parental Control'. You can use it on your iPhone or iPad to control your iOS device so when anyone use it you make sure he don't use it in a wrong way. iPhone restrictions allows you to control what features, apps, content your kids can use or can't access it on your iPhone or iPad. For an example, you can disable the access of Safari, downloadng apps from the App Store, making in-app purchases, you probably don't want your wallet get empty so fast, right ? STEP 2: Tap on General. STEP 3: Tap on Restrictions. STEP 4: Tap "Enable Restrictions" (If this is your first time to use it). STEP 5: Now type in your passcode and try not to forget it. If you forgot it, don't worry we still got your back. STEP 4: Type in your passcode. STEP 5: Tap on "Disable Restrictions". Most of websites says that if you forgot the iPhone Restrictions passcode, then you will have to erase and remove the data on your iPhone. Well that's not completely true. As you are about to see below, you can follow our guide below that will show you how to recover your iPhone restrictions passcode without the need of erasing any data. 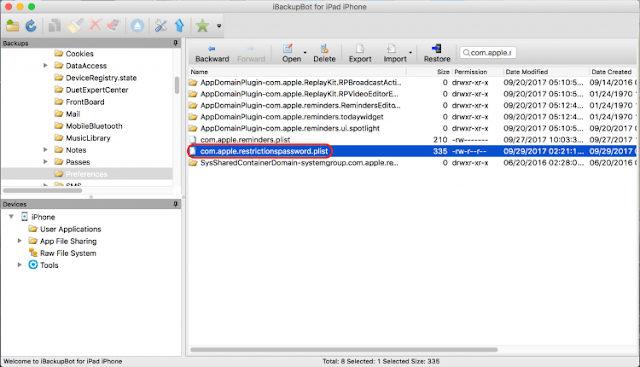 Note: Make sure to backup your iPhone via iTunes before proceeding this guide. STEP 1: Download iBackupBot from this link. STEP 2: Connect your iPhone to your computer via the USB cable. 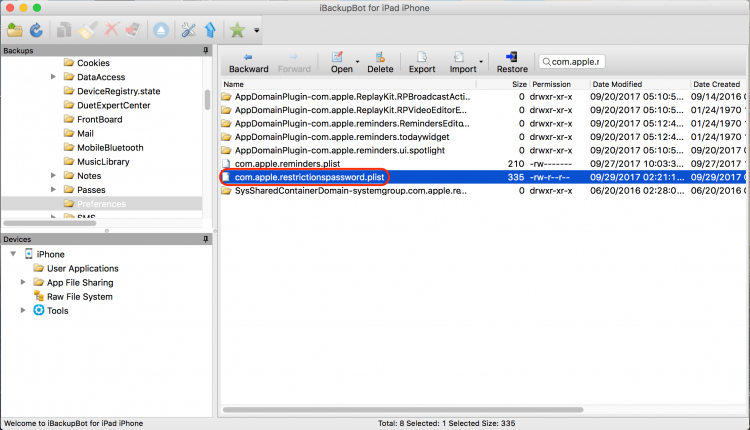 STEP 3: Open iBackupBot program that we downloaded above and make sure that the program detects your iPhone. STEP 4: You will find your iPhone files at the left bar, go to System Files ---> Home Domain ---> Library ---> Preferences. STEP 5: Double tap on "Preferences" and then search for Com.Apple.re. STEP 6: Search result will contain many com.apple files, what we are looking for is file with name com.apple.restrictions password.plist. STEP 7: Now double click on it to open the file. You will be asked to purchases the original version, simply click on "Cancel". STEP 8: Now some numbers will be shown up. What we need is these two numbers as they are marked in the following image. (Number is different from one iPhone to another). STEP 9: Now copy the two numbers and open the following link. STEP 10: Simply put the numbers that you copied earlier and put it in the following places and click on "Search for Code". 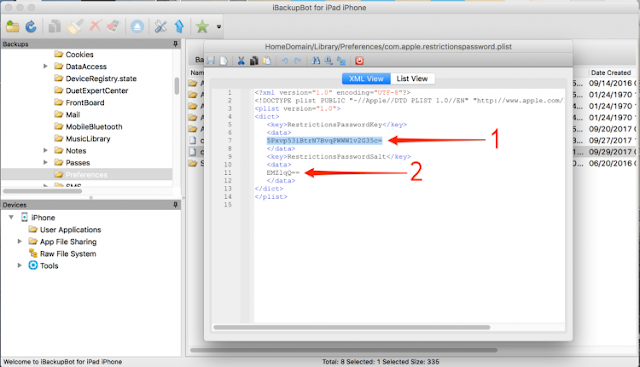 Your iPhone restriction passcode will be shown in the yellow bar. It may take some time until it appears. Unfortunately this method no longer works with iOS 12.